Sometimes we faced a lot of difficulties in Life. Sometimes life is so funny. Sometimes we never know what to do with our problem. Sometimes we are discouraged on what we have. Sometimes we are sick and tired of waiting!!! I also felt the same way, sometimes situation is not fair enough =). I just realized the people below, they have this what we call the Never Say Die attitude. Despite of all the problem and challenges they never give up. They push their self to the limit. THERE IS NO OVERNIGHT SUCCESS!!! Great quotes here! 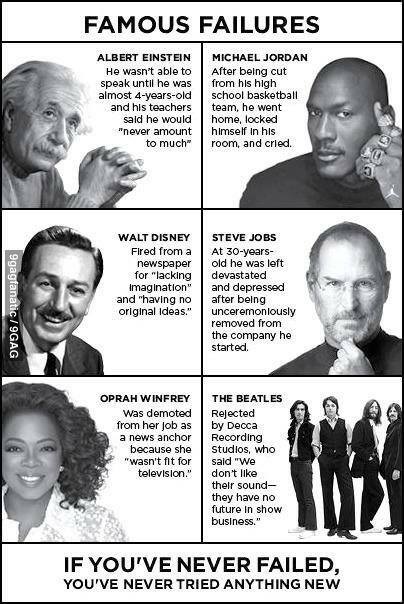 It truly becomes a paradigm shift when failure goes from something to avoid to “part of the process”.